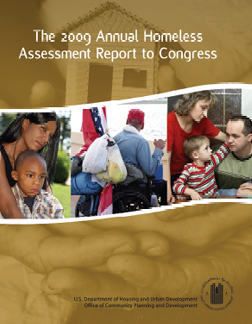 The U.S. Department of Housing and Urban Development (HUD) is pleased to present the 2009 Annual Homeless Assessment Report (AHAR), the fifth in a series of reports on homelessness in the United States. The reports respond to a series of Congressional directives calling for the collection and analysis of data on homelessness. The AHAR reports provide the latest counts of homelessness nationwide—including counts of individuals, persons in families, and special population groups such as veterans and chronically homeless people. The report also covers the types of locations where people use emergency shelter and transitional housing; where people were just before they entered a residential program; how much time they spend in shelters over the course of a year; and the size and use of the U.S inventory of residential programs for homeless people. With the 2009 AHAR, we now have three complete years of data on the numbers and characteristics of sheltered homeless people, how they became homeless, and how they used the homeless services system. This is important, because we can begin to see discernable trends in homelessness, including the effects of the recession and of changes over time to the homeless services system. Please use the download button on top of the page for a smaller PDF file.